McClure frees the Ben Moon 9a project at Kilnsey. The route is called Northern Lights. 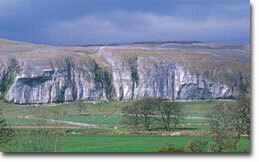 News just in reports Steve McClure has climbed what had come to be known as Ben Moon's project at Kilnsey, England. Although at present the route name is not known, it is believed to be graded 9a. The route in question came to world attention when Ben Moon attempted to link the slightly overhanging 20m desperate on Kilnsey's North Buttress as early as 1995. After dedicated training Moon eventually decided to concentrate on other projects, leaving the route open to others. This testpiece is Britain's third 9a. "The big bang", situated at Lower Pen Trwyn, Wales was climbed by Neil Carson in 1996. "Mutation", an extension to Jerry Moffat's 8c+ "Evolution", was climbed by Steve McClure in 1998. Kilnsey crag, Yorkshire. Steve McClure's new testpiece takes a line up the overhanging North Buttress, on the right-hand side of the crag.